Americans prepare to vote in the midterm elections tomorrow. US: Heading into Tuesday’s (November 6) critical mid-term elections, Democrats retain their advantage in the battle for the House, but Republicans could be buoyed by increasingly positive assessments of the economy and by President Donald Trump’s harsh focus on the issues of immigration and border security, according to a new Washington Post-ABC News national poll. 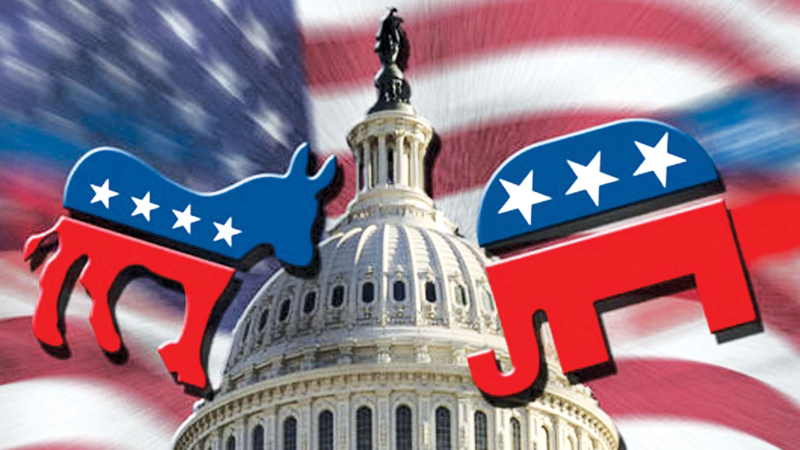 The poll finds that registered voters prefer Democratic candidates for the House over Republican candidates by 50 per cent to 43 per cent. That marks a slight decline from last month, when Democrats led on the generic congressional ballot by 11 points, and a bigger drop from August, when they enjoyed a 14-point advantage. Democrats’ also have a 51-to-44 per cent advantage among likely voters identified by The Washington Post. Presidents with approval ratings as low as Mr Trump’s have generally suffered significant losses in mid-term elections. But this President has shown over time that historical statistical benchmarks don’t always apply to him. Trump’s approval rating among all adults stands at 40 per cent, holding steady from a poll in early October and slightly higher than his 36 per cent rating in August. Those who disapprove account for 53 per cent. Among registered voters, Trump’s approval is 44 per cent, with disapproval at 52 per cent, the best margin among this group during his presidency. All mid-term elections are a referendum on the incumbent President, and Mr Trump has made this election about himself more than most presidents have, insisting in his campaign rallies that voters should approach the election as if he is on the ballot. On Friday, the Labour Department’s monthly employment report produced a string of positive numbers: another month with the unemployment rate at 3.7 per cent, the lowest in half a century; 250,000 jobs added to the workforce; and wages posting the biggest increase in almost a decade and faster than inflation. The Washington Post-ABC News poll was conducted from Monday through Thursday last week, the day before the employment statistics were announced, and records the most optimistic attitudes about the economy in nearly two decades, with 65 per cent of all Americans rating the state of the economy as good or excellent and 34 per cent offering a negative assessment. The last time optimism ranked so high was in January 2001. Among registered voters, 71 per cent say the economy is good or excellent, up from 60 per cent in August. Those who give the economy positive ratings favour Republican candidates for the House by 54 to 40 per cent, wider than the 49 to 42 per cent margin in August. Similarly, more than eight in 10 adults say they are either doing about as well financially as they were before Trump became President (60 per cent), or are doing better (25 per cent). Just 13 per cent say they are not as well off. That 13 per cent figure is also among the lowest in 18 years; the last time it dropped that low was in the final year of President Bill Clinton’s administration, when a boom in technology fuelled a rising economy. When all voters were asked which party they trust more to handle immigration, Democrats were slightly favoured by 47 to 42 per cent over Republicans. But on border security, which has been the principal focus of the President, Republicans are more trusted by 49 per cent to 39 per cent. Those who rank immigration as one of the most important issues in the election favour Republicans over Democrats by 12 points when choosing a generic congressional candidate, though the gap among this group is tenuous given its large error margin. For those who say border security is one of their top issues, Republicans lead Democrats by 42 points on the House vote. Democrats hold a lead almost as large - 39 points - among those voters who rank healthcare as one of the single most important issues. Gender and education continue to be dividing lines in the electorate. On the vote for the House, men are split 47 to 46 per cent in favour of GOP candidates, while women back Democratic candidates by 54 to 40 per cent. White women with college degrees favour Democratic House candidates by 16 points and white men with college degrees back the Democrats by 14 points. Among whites without college degrees, men favour Republicans by 39 points and women by 12 points. Young voters ages 18-39, who historically have turned out at much lower rates in mid-term elections than older voters, show a wide preference for Democrats, by 58 to 35 per cent. Those between age 40 and those over age 65 are nearly evenly divided.